Low slope “cool” roofs, those roofs covered with a white membrane or coating, are becoming popular for multi-family structures. In 2015, the cool roof coating market is estimated to total $800 million, whereas the forecast for 2025 is approximately doubled at $1.6 billion. Given the significant increase in usage, more cool roofs are being installed, potentially increasing the frequency of problems with building performance in rehabilitating an existing dark roof with a white roof. Cool roofs are typically comprised of a highly reflective type of painted coating or a sheet membrane covering; and while standard dark roofs can reach temperatures of 150°F or more in the summer sun, research indicates that a cool roof under the same conditions can be more than 50°F cooler. The benefits of cool roof materials include reducing cooling energy bills, improving indoor comfort for non-conditioned spaces such as garages, potentially increasing roof service lives, reducing local air temperatures, local cost savings, and lowered electrical demand. For these reasons, cool roofs are now a popular choice when an existing roof has reached the end of its service life and must be replaced. Many multi-family homeowner associations are tempted to change roofing systems for the cost savings; however, installing a cool roof changes the behavior of the entire roofing system. In some areas with moist climates, the cooler operating temperature of the roof system inhibits drying and may result in roof components accumulating moisture. In cold and humid climates, like some regions of the Northeast, Great Lakes, and the Pacific Northwest, this problem can worsen. This reduced drying capability and accumulation of moisture can lead to conditions where wood construction is susceptible to deterioration and metal materials to corrosion. Improper penetrations of the roof such as plumbing vents, the influx of moisture-laden air from dryer and appliance combustion and from normal bathroom and kitchen usage, and defects in the waterproofing installation can further increase moisture accumulation and damage. Leaking ducts or improper exhaust configuration can add moisture into the roof system; and the reduced drying potential of cool roofing, coupled with additional moisture, can increase the conditions that cause deterioration and damages. For these reasons, it is important to properly approach a roof retrofit to determine if a cool roof is appropriate, and implement selections and applications correctly to ensure the building’s continued performance. In considering a roof retrofit, the following recommendations can help an Owner navigate pitfalls to select the proper solution and avoid future problems. Have a qualified professional evaluate the existing roof and conditions of components, and note any deficiencies. 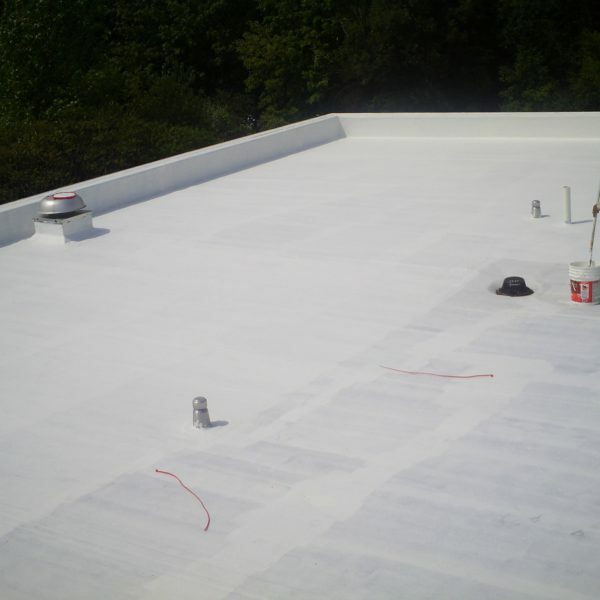 An infrared roof survey is recommended to identify any wet or damaged components, and helps with the decision on re-covering or replacing the roof. Research and obtain any historical information on cool roofs installed in the area. It is important to note that even adjacent jurisdictions may contain differing climates, and it is important to evaluate performance in as similar climate as possible. Cool roof cost should be evaluated via a lifecycle approach to determine benefits and costs as compared with a dark roof. An economic analysis methodology is provided by the U.S. Department of Energy’s Guidelines for Selecting Cool Roofs, and Roof Savings Calculator. Cool roofs in hot climates like the Southeast can be impacted by algae growing on top affecting reflectance and periodic cleaning should be included in maintenance costs. Whether a cool roof system will work and ensure that moisture will not accumulate. Identify which specific materials will provide proper building performance. This information should be passed to the Roof Designer in order to specify the proper materials that a Contractor is required to install, noting that allowing a contractor to install “alternate” materials may invalidate the analysis and should not be allowed without full consideration. The physical properties of cool roofs will change over time. The Cool Roof Rating Council has studied multiple coverings, and has documented changes in material properties over time as they become weathered. The designer or hydrothermal analyst should also consider the reflectance and emittance data of the specified product for 3 years after installation, to ensure that the roof properly performs in the longer term. If a white roof is not a viable option, modeling can determine if a less dark or light-colored surface may still provide benefits. Examination of pre-construction roof configurations and identify deficiencies or damage. Develops roof design and specifications. Evaluate selection of materials for roof, in conjunction with the hygrothermal analysis, and specify the best materials indicated by hygrothermal modeling. Evaluate materials by use of ASTM E1825 Guide for Evaluation of Exterior Building Materials, Products, and Systems, which helps identify important performance details such as performance in the local climate, service life history, installation limitations, and special maintenance considerations. Provide construction drawings to the Association. It is very important that a building permit includes this design and specification so that the contractor is required to build according to the properly specified details. Perform observations, administration and evaluation during installation. Provide a post-construction evaluation to make sure the roof installed properly. Cool roofs can be an economical solution and provide long-lasting service life; however, the system behaves differently than conventional dark roofs, and therefore should be properly researched and implemented to avoid future problems. “Cool Roofs.” Cool Roofs. Department of Energy, n.d. Web. 27 Apr. 2017. “California Cool Roofs.” Cool Roofs. 2008 Building Energy Efficiency Standards, n.d. Web. 27 Apr. 2017. “Cool Roofs.” NJ GREEN BUILDING MANUAL (n.d.): n. pag. NJ Green Building Manual. Rutgers University. Web. 27 Apr. 2017. “Cool Roofs: A Piece of the Green Puzzle.” Articles 7 – Full Cover Roofing. Full Cover Roofing, n.d. Web. 27 Apr. 2017. “Cool Roofing: Coatings Keep Things Cool.” Articles 10 – Full Cover Roofing. Full Cover Roofing, n.d. Web. 27 Apr. 2017. U.S. Department of Energy’s Guidelines for Selecting Cool Roofs, July 201, V1.2.